Brilliant third full-length album from Finland’s fashionable indie darlings Cats on Fire! The band’s previous albums ‘The Province Complains’ (2007) and ‘Our Temperance Movement’ (2009) were widely acclaimed in the music press, including reviews in All Music Guide, The Big Takeover, Blurt, The Line of Best Fit, Mojo, NME, Pitchfork, and Pop Matters, among others. The band has played countless shows across Scandinavia, continental Europe, the UK and the US, including sets at the prestigious Emmaboda festival in Sweden, the Indietracks festival in England, and the New York City and San Francisco popfests. The highly anticipated new album ‘All Blackshirts To Me’ is an unequivocal success. While showcasing the astute lyrical reflections of Mattias Björkas (lead vocals, guitar), the album also reveals a more adventurous approach. Ville Hopponen (guitar, percussion) brings quirk and soul with his multi-instrumentalist wizardry, and Mattias even dares to let a few synthesized sounds into the mix, lightening up the band’s previously rather rigorous acoustic dogmas. 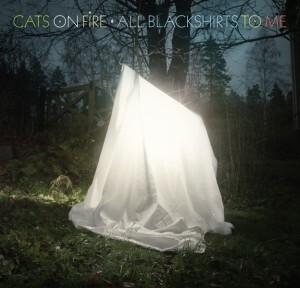 Ably backed by Kenneth Höglund (bass) and new members Iiris Viljanen (piano, backing vocals) and Yrjö Ylijoki (drums), ‘All Blackshirts To Me’ is by far the richest sounding Cats on Fire album yet. Lead single ‘My Sense of Pride’ is luxurious pop at its finest and perhaps quintessential Cats on Fire. Among the album’s other highlights, ‘A Few Empty Waves’ is an intriguing maritime tale with instantly memorable chorus and nice bursts of vibraphone, and ‘A Different Light’ is short smart pop with enticing melodies and lyrics. The album’s political observations are showcased on songs such as ‘1914 and Beyond’, a piano rich commentary on European affairs, and ‘Smash It To Pieces’, which juxtaposes contemptuous lyrics against jaunty, singalong pop with female harmonies and whistling. Rich, intelligent and cosmopolitan, ‘All Blackshirts To Me’ is an accomplished pop triumph from one of the most celebrated indie groups of today. Avevamo già incrociato il batterista Henry Ojala a inizio anno in quel mirabolante secondo disco dei Burning Hearts, progetto che lo vede impegnato con Jessica Rapo (vocalist de Le Futur Pompiste) ed uscito per Shelflife e Solina Records. Lo ritroviamo in All Blackshirts to Me, quarto disco (se contiamo la raccolta delle b-sides del 2010) dei Cats on Fire di cui Mattias Björkas è mente e artefice, e rilasciato ad inizio aprile per la Matinée Records, ormai già nell'olimpo delle migliori etichette pop di sempre. Rispetto ad Our Temperance Movement c'è meno immediatezza, ma tra My Sense of Pride e A Different Light è un bell'andare; veri maestri di un modo di costruire quel pop sospeso tra nostalgia, modernariato e amore spontaneo e universale per la melodia pura. Ma c'è di più. Sebbene l'indiepop non abbia mai avuto una valenza direttamente politica - a parte forse per quel singolo degli Orchids che si proclamava contro la poll tax: un'imposta pubblica voluta dalla Lady di Ferro (se avete modo di aprire il poster allegato al singolo Underneath The Window, Underneath The Sink troverete la seguente frase: The Orchids say don't pay the Poll Tax, oltre ad altre scritte irriverenti) - colpisce qua la dolcemente accompagnata dal piano 1914 and Beyond, con il suo testo impegnato su una digressione socio-politica europea. --Frigopop!